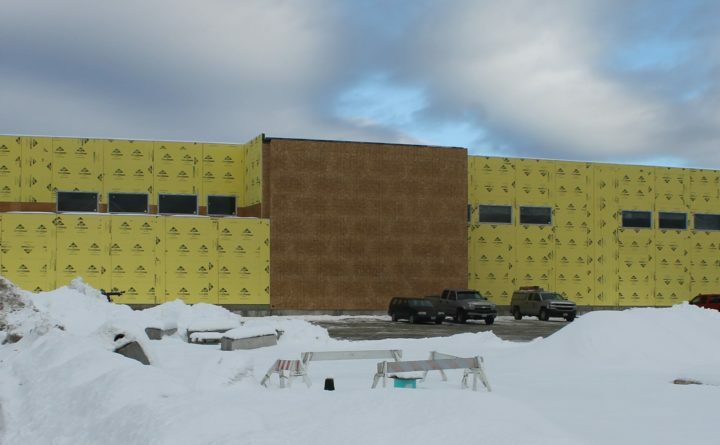 The Piscataquis County Ice Arena being built on West Main Street in Dover-Foxcroft is scheduled to open this summer to return ice sports and bring other activities to the region. The $5 million project is being funded by the Libra Foundation, and the arena will be managed day-to-day by Foxcroft Academy. The sound of skates cutting into the ice, pucks bouncing off the boards and glass, and more will be heard starting this summer, according to planners of the Piscataquis County Ice Arena on West Main Street in Dover-Foxcroft. The $5 million project, which has been under construction since last July, is being funded by the Libra Foundation and will be managed by Foxcroft Academy. “This is just a great name because it really indicates — and I want you all to leave with this message — this is not a Foxcroft Academy building,” FA Head of School Arnold Shorey said to those attending a community meeting regarding the arena Tuesday night at The Commons at Central Hall. The arena will serve the entire region. “This is a wonderful opportunity provided by the Libra Foundation and we are very fortunate,” Shorey said, referring to the Portland-based philanthropic organization created by Elizabeth Noyce in 1989 which has made significant contributions to worthy causes throughout Maine. “We need all your help; we all have to work together, all the towns,” Shorey said, noting a youth hockey program would involve communities other than Dover-Foxcroft and this involvement could grow the sport into a cooperative high school hockey team. Foxcroft Academy last fielded a hockey squad in 2006-07, when the Ponies played and practiced at the Alfond Arena in Orono nearly an hour away on the campus of the University of Maine. Explaining the vision of providing ice-related sports and recreation for the region, Shorey said, “Our goal obviously is we have to make it a solid business, revenue has to match the expense.” He said the cost for an hour of ice time for hockey, skating and possibly curling could be around $225. Jacobs said the arena will include a spectator area, locker rooms, skate shop, restrooms and concession area. “It will all be ice-related,” he said. The hope is that ice will be in place year-round — the facility could be open 24 hours if there is a need — and those involved mentioned July as a time for a potential grand opening. “A lot of technology is driven in this direction,” Jacobs said, noting summer hockey tournament participants could stay in the Foxcroft Academy dormitories just down the street. Shorey said the arena could be used for trade shows when the ice was not in use. Jacobs said the goal is for the arena to pay for its own energy bill. “We have partnered with Foxcroft Academy to manage the operation, Libra Foundation will remain the owner of the building,” said Lucas Butler, project manager for the Libra Foundation’s Pineland Farms Inc. He said should revenues not cover the operating expenses the foundation will make up the difference so the school is not footing the bill. A yearly operating cost of $600,000 is anticipated — which includes facility employees — and with the Libra Foundation funding the $5 million there will be no debt service. “There will be new hires,” Shorey said. He said a program director will begin work in the next few months, and there will be employees working under Jacobs. “We are expecting ice in the summertime,” Shorey said. Over the years, Foxcroft Academy has hosted state outdoor track championships, regional football finals and other sporting events. The school has been able to accomodate the hundreds of spectators coming to town and the ice arena should be able to do the same. “I have heard business owners say ‘that’s our busiest day of the year’ when we host state track meets,” said Tim Smith, Foxcroft Academy associate head of school and director of athletics. The head of school was asked about how ice sports can be made affordable for area youth. “We are going to write to foundations, we are going to reach out. There are lots of opportunities for equipment,” Shorey said, adding a parents group could raise funds to help make the sports more affordable so more kids would have the opportunity to play. He said the next steps are to form an arena advisory committee, hire the director of programming and get the first ice ready for the summer. Another public meeting will likely be held once the programming director is on board, Shorey said. Anyone wishing to get involved can contact Foxcroft Academy at 207-564-8351.